Steve Lawson is a UK based improvisational bass player whose music I’ve been acquainted with for many years. In Lawson’s hand, the bass transcends its usual role, instead being a lead instrument, a creator of atmosphere, and a brush that paints sonic landscapes. Steve has released many albums that explore realms along the jazz-ambient axis, both solo and duo collaborations. His latest is a duo set that documents one of 10 live shows that featured Lawson on fretless bass, looping, and processing, and San Francisco based musician Daniel Berkman on Gravikord (electric double harp), Kora, Ukelele, Handsonic, and synths. As is often the case with Lawson, the 10 performances were the only times the musicians played together; no rehearsals or planning. Fingerpainting was recorded in Altadena, California on January 25, 2013, the first of an 8-show January tour. The set opens with Antidote To Everything, on which Lawson and Berkman go into lusciously cosmic space that incorporates elements of Jazz, Ambient/Soundscape, and even bits of Shoegaze. There are some rockin’ leads that sound great against the flowing and continually evolving ambient waves, bass produced soundscapes and effects, and steady percussive beats. Towards The Sun is 15 minutes of pure space-ambient bliss. I love the flowing soundscapes, looped bass rhythmic patterns, light acoustic and electric stringed leads, and fretless bass leads. There’s a percussive pattern at the beginning that sounds like an arrhythmic heartbeat which was a bit jarring. I had the headphones on and could feel it pulsating in my chest. FingerPainting is an electro-funky groove excursion that combines 70s styled Jazz and Funk, all manner of robotic electronica, and a non-stop parade of fun effects. Herbie Hancock’s Headhunters comes to mind as an underlying influence. After a while we drift into dreamy jazzy ambience, and I hear some spaced out Prog rock styled keyboard and wind instrument sounds, all of which sound great against the contrasting energetic jazz drumming. The Further Adventures Of Mantis And Stick is a beautifully melodic combination of acoustic instrumentation and bass leads, which gets increasingly freaky and efx’d as the piece progresses, and an electro-percussive groove later joins in. The last two tracks – Invocation and Reunion – include a female vocalist named Artemis. Invocation is a lulling and grooving Space-Ambient-Jazz-Prog journey with Artemis accompanying in a quietly soulful vocal style that fits in with these guys very nicely. And Reunion is a cool grooving ambient jazz rocker with Artemis switching gears and singing in an ethnic chant style. Very nice. I said at the beginning and I’ll repeat that Lawson and Berkman met for no rehearsals or planning prior to this, or any of their performances. And keep in mind that while Berkman is credited with synths, much of this music is created with a variety of processed, looped and manipulated instruments. There’s so much happening, so many layers occurring at once, that it’s a marvel to imagine two guys improvising this live. 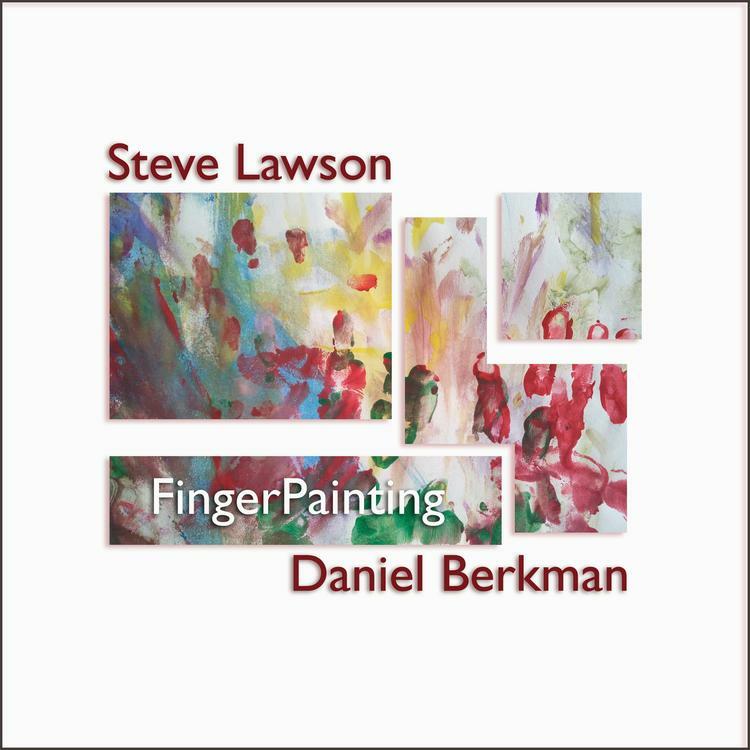 Note that Lawson and Berkman’s music is available in multiple formats. FingerPainting comes as a download album, there’s a 2-CD set featuring a “best of” selection from the 10 shows, ALL the music from all 10 shows can be had on a USB stick, plus more options.